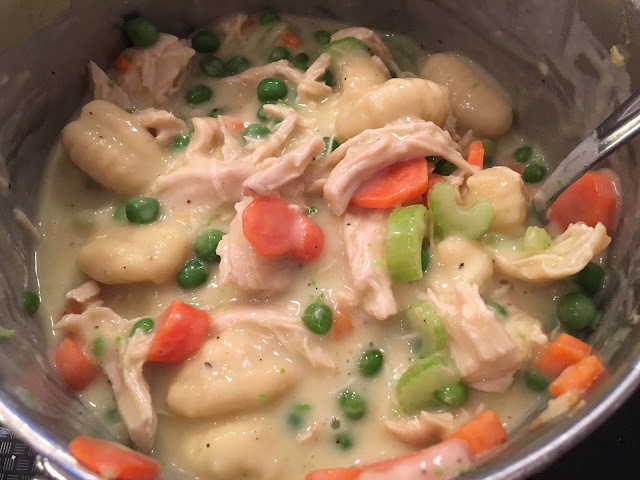 This is kind of a twist on chicken pot pie and chicken and dumplings. I posted it on Instagram and it seemed like a lot of you wanted the recipe. Plus it's SUPER easy. It takes about 25 minutes. First, cook one medium chicken breast in the oven - then shred it with two forks. Or use leftover rotisserie chicken. *I also used a few splashes of heavy cream! Here is the thing about this recipe, you can sub whatever veggies you really want. I didn't use onion, but you can. I didn't use potatoes, since I used gnocchi) but you could. I didn't use corn but you can - really make it whatever you like. First in a small sauce pan saute all your veggies in the butter. Saute them until they are as tender as YOU like them. I like veggies a little more al dente so I did about SEVEN minutes on medium high heat, while stirring. Third add the chicken broth, milk, cream if you have it, and salt and pepper. Turn the heat down and let it simmer, it will thicken pretty quickly. Fourth add the chicken. Now you can add your gnocchi. And you are done! Add more salt and pepper as needed.